Have you heard of Ello? It's a new social network site which is getting a ton of buzz for its anti-Facebook Inc. stance. It promises a "Simple, beautiful & ad-free" experience. While it remains ad-free for now, whether it's simple or beautiful is highly debatable. After all, when it comes to user experience and interface design, is there something that's unanimously beautiful? This post originally appeared on Bona Kim's blog on Medium. One day I opened Facebook and I saw slew of messages like this. After seeing at least 30 versions of the posts above, I finally asked my friend for an invitation. I am not much of an anti-Facebook (surprising, huh) and wasn't really moved by their manifesto either, but I thought, as a product designer, I should know what people are currently interested in. Or, it's a good excuse to hide my major FOMO. The site is in a beta mode, and you can easily get the full picture of the inside view by reading recent articles instead of signing up to be a beta tester yourself or buy a beta-invitation on eBay for $100. What Is Ello and Should I Even Bother? First of all, if you're looking for a Facebook alternative and feel passionate about your data privacy, I encourage you not to waste your time and wait for a few months until the site comes out of beta mode. The site has a ton of bugs. And it should! After all, that's what beta release is for. You send it out to your beta testers and get a detailed look at bugs and find out what your potential users liked and didn't like. The interesting part for Ello is that their beta users are growing at an exponential rate. According to their recent statement, 31,000 people are requesting invites per hour. Can you call an experience simple and beautiful even with a ton of bugs? What maddens me is that their promise of a simple and beautiful experience and articles confirming as such, even though it is simply not at all usable. Furthermore, Ello is NOT optimized for mobile. For instance, it will keep auto-scrolling to other sections by itself. Tapping on major CTA, such as publishing your post, then having nothing happening on the screen frustrated me and will frustrate you. This is why in agile development, we identify some bugs as release blockers. The quality control is at the basis of user experience, because frustrated users will not come back. "True simplicity is derived from so much more than just the absences of clutter or ornamentation. It's about bringing order to complexity." Let's set aside bugs for now. 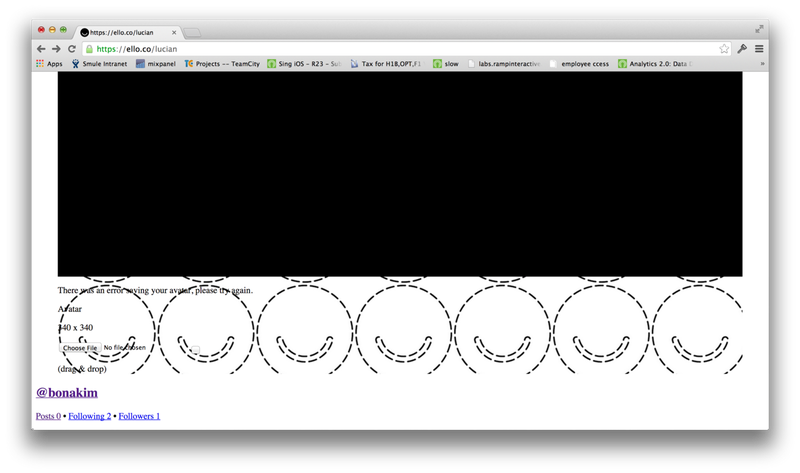 Is Ello truly simple and beautiful? It eliminated a ton of features that other social networks have. But the removal of clutter does not equal simplicity. For instance, if a user is confused about its interface, can you call that experience simple? Some articles mentioned that Ello's usability suffered, since it tried too hard to "look" different than Facebook. But the above usability issues can be easily solved without changing its aesthetics. Would you say the below design changes Ello's aesthetics? After these minor tweaks, we now have an experience that captures the initial simplistic aesthetics while at the same time maintaining standard web interface behavior many can understand with ease. Designing experience is more than designing the visual, and it includes killing bugs, building the right features, giving users the right amount of affordance and never, ever leaving them confused or frustrated. That is all for my design rant on Ello. I will soon write about what was brilliant about Ello. Stay tuned! This post originally appeared on Bona Kim's blog on Medium. She is an Experience Designer with an entrepreneurial spirit. She loves design that solves hard problems, and she is passionate about making delightful experience everyday. Currently working as a Lead Product Designer at Smule.